L'Amerique Septentrionale. Dressée sur les Observations … - DELISLE, G.
Title : L'Amerique Septentrionale. Dressée sur les Observations …. Map maker : DELISLE, G.. Size : 18.1 x 24.0 inches. / 46.0 x 61.0 cm. Colouring : Original o/l colours. 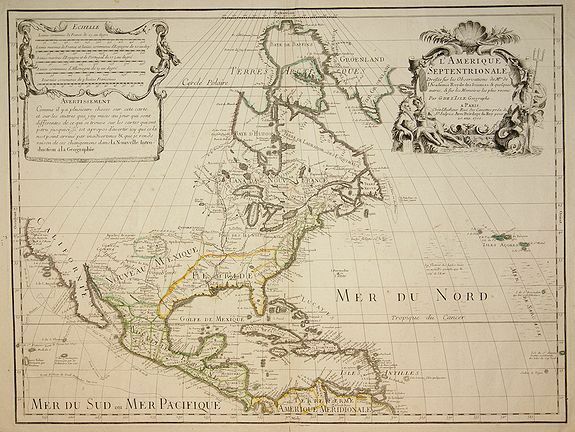 Description :Extremely rare first state of de l'Isle's highly important map of North America. ( #Tooley, The Mapping of America, p. 19). It was extremely influential on other maps of the period. It's the first map to revert to the treatment of California as a peninsula. De L'Isle accessed to this information from French explorers. Cartouche with the address : Chez l'Autheur Rue des Canettes préz de St. Sulpice. Condition : The map has been reinforced on the back. In very good condition.